All our lipstick lovers out there, this season you are going to fall in love with the flower lipstick because it’s not only pretty but also meet your meet your new beauty obsession. 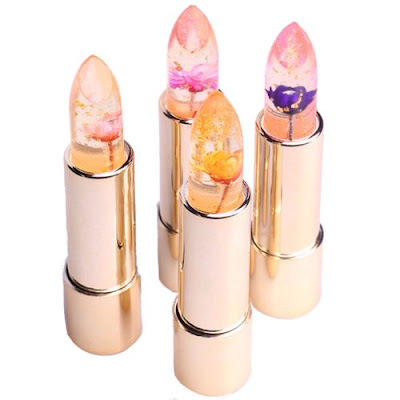 This beautiful jelly colour lipstick comes with bright and gorgeous flowers embedded in them. Kailijumei a China-based brand is behind these cute and gorgeous lipstick. These lipstick look like an opaque gloss until you wear them. You must be wondering if these flower are made up of plastic or any other material. So no more guessing birdies because these flowers are real with cute coloured specs. Shades aren’t highly pigmented, it leaves a pretty pink tint on your lips which will changes colours subject to your body temperature. Social Media platforms like Instagrams and Pininterest are freaking out over this cute flower jelly lipstick. It retails for $30 online, but it's all sold out still available for preorder though. So, the question is, are you buying these to flaunt or just stare at?